“Sauna” is a truly wonderful cinema experience – a dark gothic horror near-masterpiece which mashes the existential atmosphere of Andrei Tarkovsky with the mindbending terror of J-Horror and a dash of the Spanish films of Guillermo Del Toro. As a Finnish-Russian co-production its a unique collaboration, set in a time and place virtually untouched in the movie landscape. It’s the year 1595, on the border between Finland and Russia. A long bloody war between the Swedes and Russians has just ended, with Finland caught in the cross-fire. A group of Finnish and Russian geographers are on a journey to map the new border between the two Empires. When they happen upon an uncharted village in the middle of a giant swamp they encounter a dark ghostly curse which threatens the lives of the group. Screenwriter Iiro Küttner and director Antti-Jussi Annila have a traditional ghost story on their hands, but execute it with metaphysical and at times confusing narrative. It’s a complicated set-up to start with and the filmmakers are careful about telling too much information which we couldn’t deduce visually. The unfamiliar period of history means there’s a political dynamic which takes a while to grasp. We are given few details of the village, the sauna, the history of its inhabitants and the dark forces around. But the heart and central conflict of the film is clear. Our heroes are the two Finnish geographers and brother, Erik and Knut. Erik is introduced early as a maddog warrior with 73 killings on his conscience. Knut is along for the journey to help him get a job as a teacher, so he can live a quiet scholastic life. 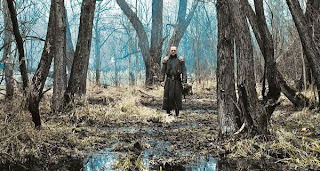 When Erik murders a Russian villager and leaves a young girl locked in an underground cellar to die, their divergent principles put them at odds. The other point of conflict is the relationship of the geographers with the village itself and the ghosts that haunt it. The presence of these metaphysical forces causes each character to have horrific delusions. This feeds the strongest theme of the film - their moral and religious conflict. Some research into the history of Russian/Scandanavian relations would probably create deeper meaning in the film, but we gather there’s a bitter feud between the Russian Orthodoxy and the Scandanavian Protestantism. But the real conflict is Erik’s own acceptance of God and his need for confession of his laundry list of sins. Though the film is vague about the dark forces, we gather it’s that vengeful one, which Catholics are taught to fear. And so it becomes a truly terrifying Wrath of God. Like Tarkovsky Annila uses the cold and lifeless environment to create mood. But he also has great lead actors to bring life to the two Finnish characters. Tommi Eronen and Ville Virtanen are a great pairing. Virtanen is the great discovery though. Annila gives his character a natural arc of personal redemption and the need to find family honour, Virtanen's hardened and course face appears to be carved out of stone, each wrinkle and facial crevasse reads as the physical expression of these emotional battle scars. The quick ending allows us to formulate the meaning behind the actions in the film ourselves. While all the dots aren’t connected for us, the themes and conflict are clear enough for the film to make perfect sense. I've seen Sauna twice now and it stands up as well on both the big screen and the small. Enjoy. This looks excellent! Thanks for the review, I am going to check this out.